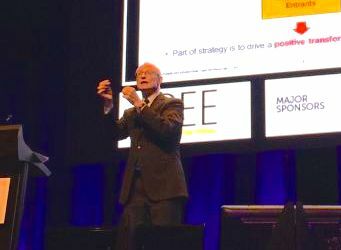 The worst mistake in strategy is to compete with rivals on the same dimensions, Professor Michael Porter told the World Business Forum in Sydney this morning. The man who’s made strategy his life work says many businesses still get confused around the definition of the concept, and that even trying to be ‘the best’ means a business is starting in the wrong place strategically. Professor Porter told delegates that the place to start thinking about strategy is to have the right frame of reference. “Think about competition, because ultimately strategy is about competition. The question is: how do you think about what competition is really like, and how you win. That’s exactly the wrong place to start, he said. “If you think about strategy this way, where does that lead you? That leads you to a race to one ideal way of competing, and the problem with that is if there is only one way of competing and everybody has to race to the same place, it’s not going to be pretty. “Even more importantly, what we found in industry after industry is that there is no best way to compete. There are multiple ways to compete, depending on whose needs you’re actually trying to serve. We all know it’s impossible to meet every need of every customer uniquely well. That’s impossible. There’s no one way to deliver value. “Strategy starts with a notion that the fundamental question is not how to be the best, it’s actually how to deliver something unique. To the customers you’re choosing to serve. Not because what you’re doing is ‘the best’ but because what you’re doing is delivering distinctive value. Strategy is about being unique. That’s ultimately what all successful companies are able to achieve for some period of time. “There’s a lot of use of the word ‘strategy’ that actually gets in the way of real strategy. While expanding internationally might be the right course of action, it’s not a strategy, Professor Porter said. “Strategy is the set of choices you make which collectively define your position. It’s putting those choices together, not the individual actions, that constitute a real strategy.